AHM's initial FP-45 offering was built by Lima and imported from Italy. The model differs greatly from AHM's second FP-45 model. The Lima FP-45 features filled-in front and rear pilots, unlike the later AHM FP-45, but in order to make this long diesel navigate 18"-radius curves the pilots are cast onto the trucks and swing with them. The engine's steps coming down from the cab are also cast on the truckside frame. The only roadname to cross between the Lima-made FP-45 and the later Mehano model is the Santa Fe example. AHM apparently had both FP-45s available for a time in the middle 1970s, as at least one price list I have includes reference to both this 5174 stock numbered example and the 5150 stock numbered Yugoslovian-made FP-45s. 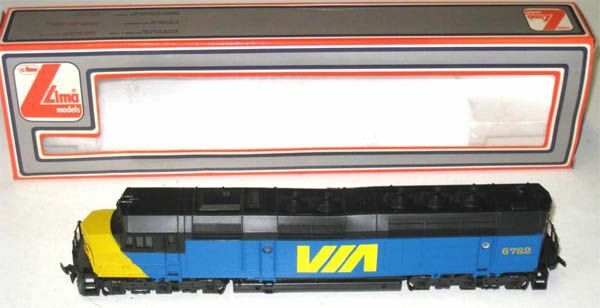 The retail on the Lima-made model was $16.98 and it appears to have been offered only as a powered example. The Santa Fe FP-45 in my collection includes no description on the AHM box flap and simply carries the stock number 5174 C. Beyond an attempt to separate the two FP-45s, I have no info or reason for AHM's terming this an FP-45C in some listings. 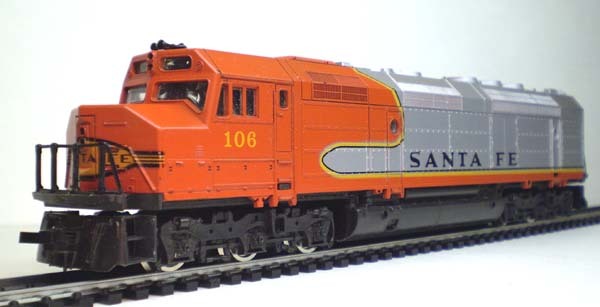 Only the Santa Fe example in the AHM collectionn of FP-45's had a 1:1 scale counterpart. Original buyers for the late '60s produced EMD 3,600 horsepower FP-45 included only Santa Fe and Milwaukee Road. The Burlington Northern example is in the neighborhood, the BN inherited Great Northern's similar looking F-45's. The Lima FP-45 was sold under the Model Power's PMI (Precision Model Inc.) name beginning in late 1974, after it departed the AHM catalog. Sold under Model Power's PMI subsidary, the FP-45 was available in their line in the three roadnames also sold by AHM (Burlington Northern, Canadian National, and Santa Fe), plus Penn Central and Spirit of '76. The Penn Central example is found above, you may click on the image for a larger view. An ad from Charles Merzbach's Charmerz line in a 1973 Model Railroader shows the Santa Fe FP-45 and states that Charmerz offers the model in Penn Central too with a $17.98 retail price. Lima also sold the FP-45 under its own name. A Lima CN-VIA FP-45 is found below. You may click on image to open a larger view. 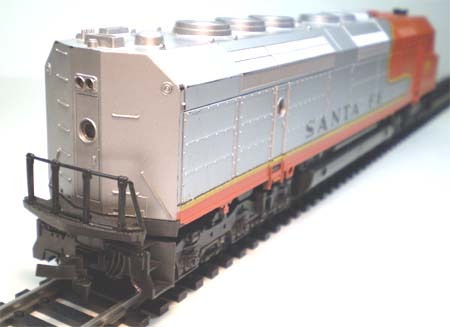 AHM's N-scale line included an FP-45 produced by Lima. You may read about the prototype EMD FP-45 at Wikipedia.org.